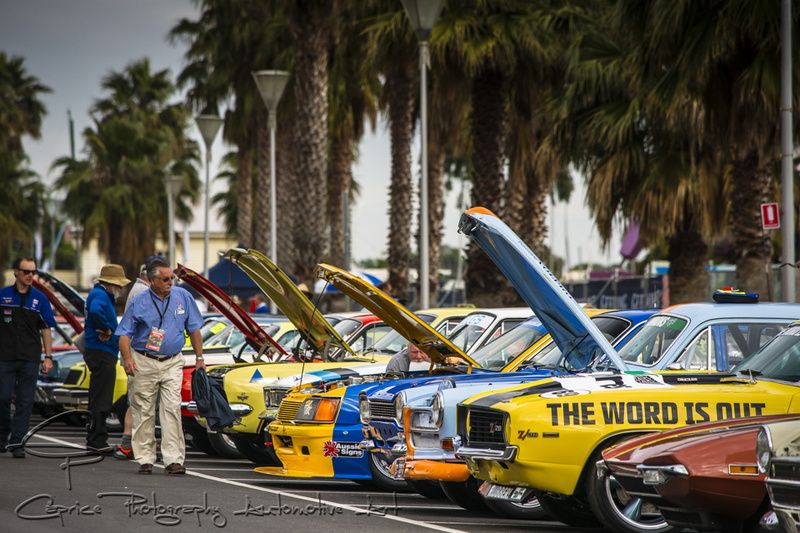 The Geelong Waterfront once again came alive with the sounds of racing engines and the sights of all things automotive, from beautifully restored classic cars and bikes along with late model sports cars. Complementing the two and four wheeled machines were a multitude of automotive based trade stands and displays. Beach side revival (racing the clock)! The original planners of the city of Geelong must have had fuel running through their veins when they set about creating Eastern Beach and its entry because you don’t build a 1/4 mile stretch by accident, do you? 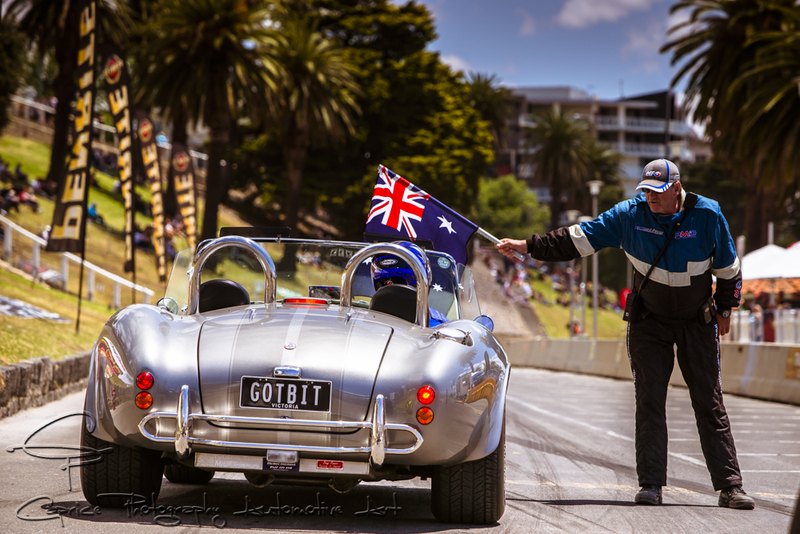 Once again the city of Geelong came alive with the reverberations of classic engines revving up Ritchie Boulevard surrounded by the vibrant colours of a street festival in all its glory. Classic cars and bikes gleamed in the hot sun accompanied with the vibrant early fashions of this motoring antiquity. The two day event sees likeminded motor enthusiasts test their mettle against the clock as they power down the eight mile strip flanked by picturesque seaside palms and grassy banks lending themselves well to those looking for a great viewing vantage point throughout the day’s proceedings. For 10 years Geelong’s own speed festival has laid dormant at the back of the events cupboard, covered in cobwebs and dust till finally a group calling themselves The Geelong Revival organization brought it back out into the open, dusted it off, tweaked it to their liking and laid it out for those of us who still have a hankering for some good old fashion eighth mile racing!! Taking place along Geelong’s beautifully presented waterfront, this classic car spectacle, covering all genres from around the globe, ran across two days seeing a wide array of fantastic automotive creations from a bygone era through to a smattering of later model equipment test their mental against the clock as they gave their machines all they’ve got. From vintage race cars of the 1920s, home built equipment, MGs, minis, midgets, Aussie and American iron and every other conceivable racing marques, car enthusiasts were guaranteed to have their fill of automotive memorabilia from a cacophony of roaring engines, squealing tires and fumy exhausts while being visually stimulated by the varying shapes and designs of these classic beauties! To compliment the eighth mile racing, Shannons Insurance sponsored a classic car and bike show seeing polished and pristine machines of all makes and models cover the lush grass areas and waterfront real-estate found around EasternBeach and stretching as far as Cunninghams Pier. If that wasn’t enough to keep you busy, the Steam Packets market ran all weekend while Sunday saw the inaugural running of the Fashions on the Field parade adding a touch of class to the whole festival. I could continue to rave on about this event but like I said, it’s a visual thing so why not take it in yourself with a gander through my pics and let your imagination take you through the motions those who attended experienced and hopefully we’ll see you there next year guaranteeing the same professionally run, if not bigger, event in all areas!